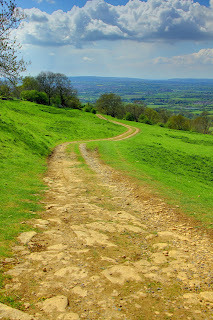 We spend a lot of this Lenten season talking about roads, journeys, wandering, pathways, and “getting back on track”. Do you sense that there is a theme? The truth is, life is full of roads, whether it’s a 40-year long road through a desert wilderness, a leisurely afternoon drive through the Texas wildflowers, or a quick drive to the grocery store. I just completed a three-day meeting (that was close enough for me to stay at my house) and in the six times that I was in the car, I actually took six different routes. One included a side errand to Target, one took me out of my way enough to drop Maynard off at Yuppie Dog (yes, “Yuppie Dog”–I supposed I’ve become completey urbanized! ), one involved lunch at a Chinese restaurant, two involved “alternate” routes than that nice woman on my GPS told me to go, and two were because I was talking to my friend who was with me and missed the exit. (As a matter of fact, yes, that does happen to me often!) But the point is, life is full of roads and there are probably more moments than not that present us with the choice of whether to take the one that will get us there the fastest, the one that will provide the most scenic route, the one that will avoid the traffic, the one with which we’re most familiar, the one that will get us back on track, or the “one less traveled by”. I don’t really think that God lays down some road at the beginning of our existence and then expects us to stay walking straightly down the center. In other words, I don’t necessarily think that veering from the road in front of us is wrong. Truthfully, if anyone tries to tell you that they have stayed on one straight road or have walked it with one focus or one thought their whole life, I would propose that they are probably standing not far from where they began. The Scripture passsages that involve roads seem endless (no pun intended)–wilderness roads, roads to Jerusalem, roads to Emmaus, roads to Bethlehem, roads through Galilee, the road to the Cross, and the roads home. Perhaps all those roads are not necessarily there to show us the right one to walk; perhaps instead they are there to show us that no matter what path we’re one, we’ll eventually end up returning home. So, on this Lenten road, travel with an awareness of all the choices you have and the way God brings a road through them all.